Does Dark Matter Have an Electric Charge? Does dark matter have an electric charge? No one's really wondered before, but researchers are exploring the possibility that some dark matter particles do, indeed, have a small electrical charge and that they interact with normal matter through electromagnetic force. 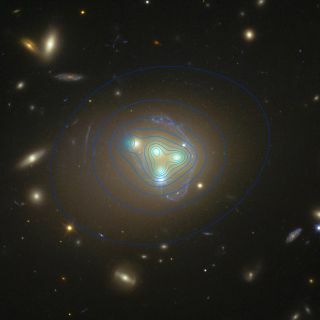 Julian Muñoz, a theoretical cosmologist at Harvard University in Cambridge, Massachusetts, led a new study alongside collaborator Avi Loeb, a theoretical physicist and professor at the Harvard-Smithsonian Center for Astrophysics (CfA), to try to determine whether some dark-matter particles have a small electrical charge. "You've heard of electric cars and e-books, but now we are talking about electric dark matter," Muñoz said in a statement from the CfA. "However, this electric charge is on the very smallest of scales." Research from the Experiment to Detect the Global EoR (Epoch of Reionization) Signature (EDGES) — a collaborative research project located at the Murchison Radio-astronomy Observatory in Australia — inspired Muñoz and Loeb to investigate the possibility of electric dark matter. In February, the EDGES scientists announced that they had detected a radio signature from the first stars to form in the universe. Popular theories posit that, when this first generation of stars emitted ultraviolet light, that light interacted with cold hydrogen atoms between the stars, which, in turn, allowed them to absorb cosmic microwave background (CMB) radiation left over from the Big Bang. The EDGES team claimed to have found evidence for this CMB absorption, though other scientists have yet to verify the finding. The EDGES team also found that the temperature of these hydrogen atoms was half of what they had expected. Muñoz and Loeb interpreted these findings, especially the unusually low temperature of the hydrogen atoms, as possible evidence for an interaction between dark matter and normal matter, according to the statement. "If EDGES has detected cooler-than-expected hydrogen gas during this period, what could explain it? One possibility is that hydrogen was cooled by the dark matter," Muñoz said in the statement. "We are constraining the possibility that dark matter particles carry a tiny electrical charge — equal to one-millionth that of an electron — through measurable signals from the cosmic dawn," Loeb said in the statement. However, the team has no way to prove the theory yet, as "such tiny charges are impossible to observe even with the largest particle accelerators. "Muñoz and Loeb further explained that normal matter would have been moving very slowly at this early time in the universe, and electrically charged particles scatter more easily when they move slowly. So, if some dark matter particles were charged, normal matter and dark matter would have interacted very strongly, and these interactions caused by the charged dark matter particles could have caused the hydrogen atoms to cool drastically enough to explain the low temperatures that the EDGES team found. Some astronomers challenged the EDGES results, but Muñoz and Loeb will continue to explore how this research might improve our understanding of dark matter, according to the statement. Loeb expressed in the statement, "We're able to tell a fundamental physics story with our research no matter how you interpret the EDGES result. The nature of dark matter is one of the biggest mysteries in science, and we need to use any related new data to tackle it." Although Muñoz and Loeb cannot yet prove their theory with direct observations, if small amounts of dark matter do have weak electrical charges, it might help to explain the EDGES data and support the findings of other dark-matter research, according to the statement. This study was published Wednesday (May 30) in the journal Nature.